On May 27th 2009, I met a group of amazing people. We had a health 2.0 meeting hosted by Christine Kraft. On that day Fred was in hospice and my life was at a crossroads. I was still a wife, a toy store clerk, and a sometimes artist. 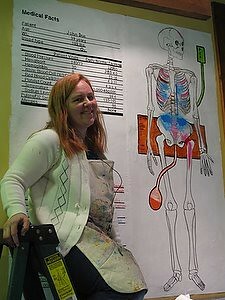 In three days I would be placing my first mural in the medical advocacy series. I met that day a group of people who would support me as I entered a new life of an art/health activist widow. I met Cindy Throop, Susannah Fox, Claudio Luis Vera, Nancy Shute, Dave Debrokart (By phone), and Ted Eytan, MD. And that made me think about Stephen King’s Dark Tower books. If you have read the Dark Tower series you are familiar with the concept of Ka. It is described as a controlling force in our lives. Call it destiny or fate, or even call it God moments. It is the energy that brings us together on the path of our life. My husband Fred loved this concept so much that his screen saver on his computer endlessly scrolls, ”All things serve the Beam.” And within in the concept of Ka, exists the idea of Ka-tet. A Ka-tet it a group of individuals brought together by Ka. They walk same path of the beam towards the Dark Tower. They are one from many. In Stephen King’s Dark Tower books his Ka-tet consisted of Roland- the Gunslinger, Jake Chambers, Eddie Dean and Susannah Dean. They are on quest together. They are Ka-tet. On May 27, 2009 I found my Ka-tet and the quest was called 73 cents. Towering on the table was my husband’s medical record. This was a very important book, for on the table lay the story of Fred. Here began our journey. How could we change the world and create patient centered care. How could we access the data silos that seemed do distant and inaccessible to patients and their caregivers? For the past year we have all worked on this goal using our many talents and abilities. I have had the pleasure of speaking on panels with Ted several times. We are great together. The energy of the other makes both of us better. When the patient and the doctor work together as a team great things can happen. Last night I had the opportunity to co-present with Ted at Health 2.0 Stat in Bethesda. We spoke about the importance of the patient and goal of patient access. And reminded those attending that when we speak of patients we must not forget “the face of our father.” I came to speak about the ways art can effect change within medicine. I also came to talk about how books can save lives. And if failing that goal, how books can help a life have meaning. Do you know this face? Do you know this name? He is not the patient in room 6218. He is not “unfortunate ym 39yrs old..” He is Frederick Allen Holliday II, Phd. He was a loving husband, a devoted father, a professor of film studies, and a great friend. He was hospitalized for 79 days with a diagnosis of kidney cancer. I had the honor of being Fred’s wife for almost 16 years. He fell in love with me at first sight… twice. He first saw me painting a flat at OSU in the fall of 1992. He saw me from behind and my long hair was trailing down my back. He thought I was beautiful. I did not see him, and cut my hair short the next day. He met me again about a week later and we talked Stephen King. We both loved horror stories. My favorite was The Stand, and he loved the Dark Tower books. We were meant to be. Do you know this face? Do you know this name? She is not “the wife in room unhappy with progress.” She is not “little miss A-type personality.” That is what Fred’s oncologist called me as I spent days trying to get access to the medical record. He told Fred, “that if little miss A-type personality wants information she should come to his office hours.” I did. He never stopped answering the phone, talking with his nurses and he never closed the door during my one appointment with him. This face is Regina Holliday. I paint myself in the picture. I am loving mother, an artist, and I was the wife to a great man. I asked for weeks for access to my husband’s medical record. I was allowed to view an imaging report for three minutes by an internist. I am not sure I got much out of my three minutes, and he told me he wasn’t supposed to let me see the information at all. I went down to medical records to ask for a copy and was told it would cost 73 cents per page and I would have to wait 21 days. I have spoken about this event and blogged about it. I have often seen comments saying I must have not tried very hard to get the copy. I have something to say about that. There is always a B story and an A story. My husband studied narrative and would have told you that. All the while I was trying to get access to Fred’s record I was trying get another very important book. When I realized the advanced nature of Fred’s cancer I began emailing my friend Deborah about Stephen Kings’s new book that would release in November- Under the Dome. She emailed the publisher’s rep, and he emailed the publisher. They got permission from Stephen King to print an advance galley. Fred was told he had tumors and growth on March 27th 2009. On April 7th 2009, I handed Fred a copy of a book that would not be available to the public for six months. Thank God for that book. Fred read it during every transport for radiation. It helped him in his darkest hour. And thank God for the Dark Tower, for I would scream the words of those books over the train-rushing roar of the MRI machines. I was unable to get a copy of Fred’s record for many weeks to come. Once I had access to the record, I used it to create an easy to understand “facesheet.” That became the design of the Medical Facts mural. 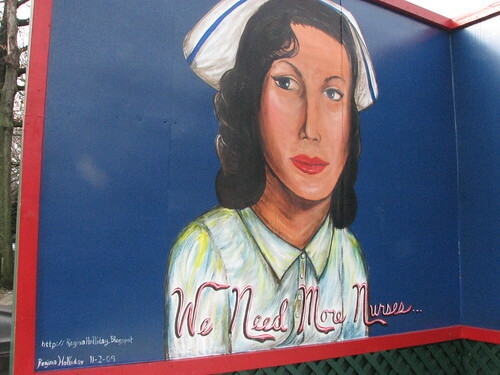 Then three days after meeting Ted and all the rest of my new friends, I painted Fred’s Medical Record on a wall in a local Deli for all of our neighbors to see… Next, my new friends in the world of Health 2.0 began blogging about the mural. You can see their posts here, here, and here. "I do not aim with my hand; he who aims with his hand has forgotten the face of his father. On June 23rd I began painting 73 Cents- my personal Guernica, and no one would forget this face. I would use my eyes, my mind and my heart and vow to make health care better for us all. I painted 73 Cents from June 23rd to September 30th 2009. It is still there today, at 5001 Connecticut Avenue in Washington, DC. It is a monument to Fred and patients everywhere. And just like the internet, it advocates 24 hours a day, and you cannot tell it to shut up. I have read many horror stories in my life, a lot of them were written by Stephen King. But these are the true horror stories. These people have taken their pain and anguish then condensed it into a book so others do not have to suffer as they did. In each book, you read about that horrible moment, when if only these people could have had real time access to the medical record, someone would not have had to suffer or die. It reminds me so of Stephen King. It happens often in his work. He warns the gentle reader, you could stop reading right now and pretend the story ended well, but often it does not end well. I have communicated with all of these authors via email. They want you to know their story. They want you to see their faces. Do you wonder if it matters if someone hears the patient’s story? Do you doubt that working together we can create a better medical system? On Tuesday the 13th 2010, I presented a speech at Health and Human Services about the importance of patient access to the electronic record during the announcement of the definition of Meaningful Use in the final rule. Politely, I echoed e-Patient Dave’s call to action- Give us our data. How did I get to speak? I spoke because a husband and wife who own a deli gave me a wall. A man who owns a gas station gave another wall. I painted and you blogged, tweeted, and posted on Facebook. We are all patients in the end. Together, let’s change the face of health care. Painting the piece: "Give Us our Dammed Data." On Sunday morning, my son asked, “Mommy, are we going to Church today?” He looked around our living room at all the half-finished canvases and doubtfully said, ”We probably should stay home so you can paint.” Though I try to make it service most Sundays, sometimes I do stay home so I can finish a project. So Freddie’s question was not overly manipulative. But my defiant Mother gene kicked in and I said we were, indeed, going to Church. It was very good to hear this lesson because it reminded me it sometimes important to stop the frantic doing and listen to what others have to say. If you have been following my posts on Facebook or Twitter or have run into me in person in the last three weeks, you probably know I am preparing for my first Gallery Show at Clinovations in Georgetown (Please RSVP here http://clinovations.pingg.com/73cents ) The show is on July 29th, 2010. Currently, I spend everyday painting as I prepare for this event. I am running out of time, and yet I will stop work on July 28th to attend a forum. I will delay setting up my show to listen to some special people who are working to provide better care for all of us. If you'd like to attend this event you can RSVP online at http://www.nationalpartnership.org/site/Calendar?view=Detail&id=100323. Join us on July 28 for breakfast and an enlightening and inspiring forum discussion among caregivers, patients, thought leaders and policy makers on how to best implement health reform and delivery high quality care to our most vulnerable patients older adults with multiple health conditions. There will be an author speaking from the heart about her own personal tragedy and there will be “ordinary people” speaking out about their trials and tribulations in the hope, that in so doing, they can effect change. I have chosen the good part. I will listen at their feet. On Tuesday July 13th, 2010 I was asked to present a speech at the Department of Health and Human Services representing the patient voice. This is the text of that speech. I am artist, a mother and I was the wife of a great man. I know in a very personal way why patients need access to the electronic medical record. Last year at this time, I was painting a mural on a wall in northwest Washington, DC. I was a new widow, my husband had died of Kidney Cancer on June 17th. The painting was called “73 cents.” It depicted our family lost within a closed data loop, without access to information. From January to March of 2009, my husband, Fred Holliday, went to his doctor a dozen times for pain. Each time he was sent home with pain meds and he never received an after-visit summary. He visited 2 ER’s with extreme pain and was sent home with pain meds each time. By mid March, Fred was taking four types of pain medication, two types of muscle relaxants and four types of laxatives and we had no diagnosis. On March 25th, Fred was hospitalized for tests. On March 27th the oncologist told my husband while he was alone that he had tumors and growths. The oncologist then left town for four days. My in-laws and I spent the next days begging for information from Fred’s doctors. We were continually hospitalized and had no access to the written record. Fred suffered additional injuries due to a lack of communication between staff and a lack consultation with his record. After four weeks of enduring the utter horror of not knowing what is going on. I went down to medical records and asked for a copy of the electronic medical record. I was told it would cost 73 cents per page and there was be a 21 day wait. I was astounded. This was a state of the art hospital, yet they were asking us to wait 21 days and spend hundreds of dollars just to read Fred’s record. The next day the oncologist said, “We are sending you home on a PCA pump.” The doctor left and we burst into tears. Fred turned to me and told me go after them and to try to get him care. We were transferred to another hospital five days later, with an out of date and incomplete transfer summary and records. Fred was denied food and pain meds. for six hours while the staff of the new facility tried to cobble together a medical record using a phone and a fax machine. I eventually got a copy of Fred’s record and –despite its many errors– it became a virtual bible that we used to guide his care for the last 56 days of his life. There was not a day I didn’t reference it, and that information extended Fred’s life helped create a fragile peace within our hearts; for there is no greater sorrow then watching your loved one suffer while you feel helpless because you don’t have the information to know what’s going on. I don’t have a back ground in medicine, but I know enough to help. With access to his record, I could explain treatment options and help ease his mind. This is why I paint. This is why I speak, so others will not have to suffer as we did. We are all patients in the end. We all deserve to be treated with dignity and respect. I will not stop, I will not give up, until we get change in this nation, until people get taken care of, and we all have the right to access our own information. Thank You.